Trinity Trail Alliance is currently working on the Trinity Bike Park Project and Trinity Lake Trail projects (see below). We also will be supporting trail work days, bike races, fun rides, nature hikes and other events. We have a lot of great ideas and we welcome input from our members. If you have something you want to work on, contact us and let's get started! We are excited to announce our commitment to building a bike park in Weaverville! ​​The bike park will provide a safe and fun environment for people of all ages to build on their bike riding skills. The bike park will include a pump track, adventure trails, and specific skill-building challenges like jumps, ramps, elevated tracks, and switchbacks. Riders will be able to progress through the challenges, improving their skills, enabling them to explore Weaver Basin Trails with more confidence and ability. The bike park will also provide a fun and healthy place to hang out with friends and family. 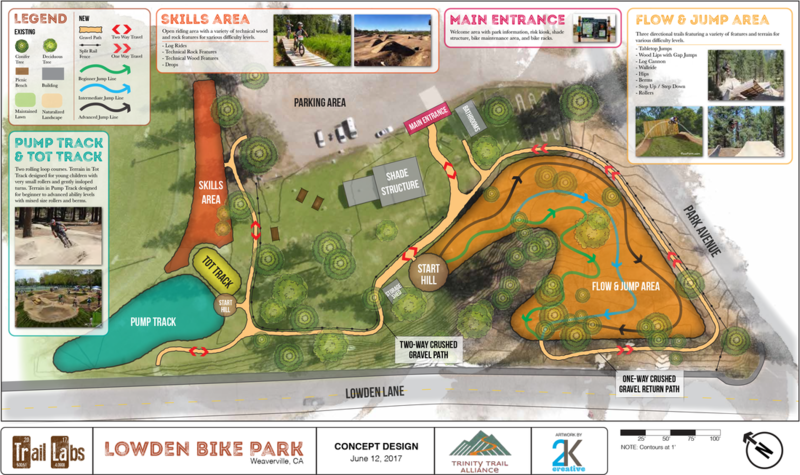 In a short amount of time the bike park project has already cleared several major hurdles and gained broad community support. We are excited to announce Trail Laboratories, LLC, has completed the bike park design and construction budget. Now funds are needed to help cover construction costs. If you are interested in helping or donating to the project, please contact us directly. You can donate directly to the bike park project, just send a check to Trinity Trail Alliance with a note "bike park"on the check. All donations are tax deductible so please include a return address for your receipt. The proposed Trinity Lake Trail will circumnavigate Trinity Lake with connections to local community services and the US Forest Service campgrounds. It will include single track, highway, and gravel roadways and it will be fun, adventurous, and provide world class views of the Trinity Lake Basin from the top of County Line Road. The Hayfork group, 'Friends Enjoying Ewing Trails’ (FEET) is leading the creation of a mixed use trail system at Ewing Reservoir for hikers, bikers, and equestrian user groups.